Some computer viruses disable system specific features to make it harder for the computer user to detect and remove them. Most people will understand that something is wrong if the Windows Task Manager or Registry editor are not opening up anymore, disabling the features will on the other hand delay the removal of the virus from the system. Antivirus software that cleans the virus may sometimes fail to cleanup the system properly. It can happen that Windows features are still not accessible even after the virus has been removed from the computer system. That's where tools like Re-Enable aid the user. The software program offers to activate Windows features like Regedit, Windows Task Manager, System Restore, MsConfig or the Control Panel after a virus attack. It displays all features in the main interface upon startup. Some or all of the apps and functions can be selected for fixing. 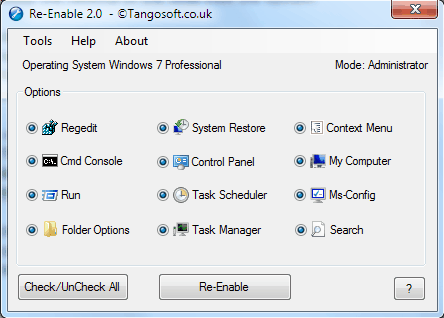 A click on the Re-enable button after the selection will start the recovery process. The program offers a Tool menu on top that comes with additional troubleshooting utilities. Here it is possible to restore Safe Mode, edit Hosts files, reset files and folder attributes, unhide drives, repair the desktop, repair explorer.exe startup problems or scan for and delete autorun.inf files.